Gun Runner's latest work with Gettysburg- video imbedded. I cant wait for the Pegasus and then for May when I get to see him once again - only this time he'll be at Three Chimneys. Gun Runner's work Jan. 7 with Gettysburg. He'll have one more work at Fair Grounds next week before flying over to Gulfstream Jan. 18. Bittersweet, are the final pages of a story, when the sun begins to set on a job well done. It is these times in which we savor every touch, every feeling, every heartbeat— because these moments, no matter how small, are felt deeper, when being felt for the final time. As he steps upon the racetrack this morning, he stands taller— prouder— as if he knows his curtain call is looming. Not a particularly large animal, he possesses an innate ability to stand above the rest of the workers passing by in the early hours of the day. His stature comes not from the hands on a measuring stick, but from the fire within his very heart— the age-old nobility within his eye. He is the center of his own universe— the ruler of his realm. His ears flick forward and back— side to side. He tilts his head in the direction of the consistent clicks coming from the rail behind him; every snap, capturing a moment forever frozen in memory— to be revered when times such as this, exist no longer. He will soon leave this place, these mornings behind— for greener pastures, and the luxury of a retirement so richly deserved. Still, for this decorated warrior, a final battle lies ahead— one where he will meet, once more, worthy opponents of old beneath a grandstand awash with those who have come to witness greatness— and the swan song of the blazing-red hero before them. Their eyes will fixate upon his braided mane—his flowing tail— the fury in his gait. This is the image they will most remember of a horse bigger than life, when the final sip of warmth from the day is gone. The look of eagles with a touch of imp. he really is one handsome son of a gun! Really looking forward to the big race. You can really see what a little fellow he is in this picture. Gun Runner re his PP draw - "Here - hold my beer. Watch this." He may not be tall, but he's built like a brick outhouse. 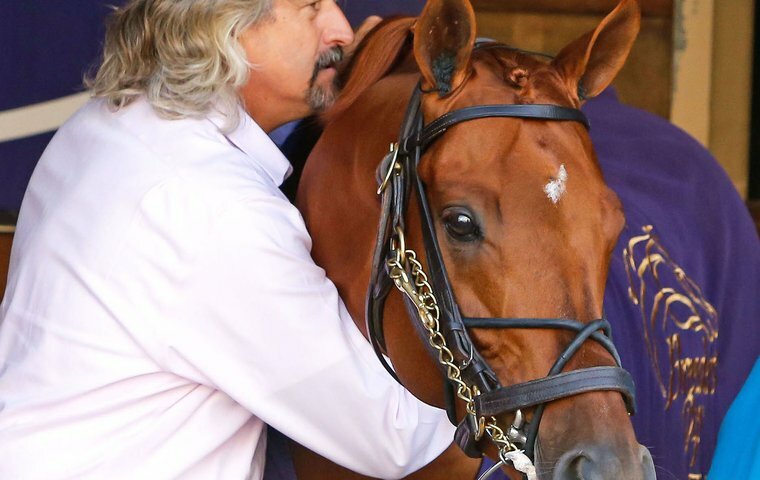 In the narrow confines of a paddock saddling stall, the most personal kind of quiet conversation began to unfold between trainer Steve Asmussen and his sleek chestnut charge, Gun Runner. In those precious seconds, when horse and man communicated in ways that might forever be a mystery to most, they existed in a world of their own. 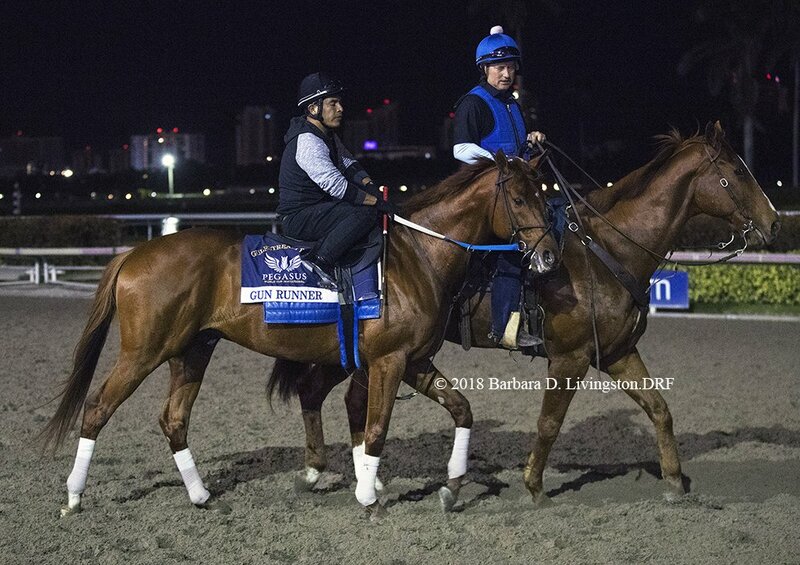 Asmussen reached to straighten the purple cooler emblazoned with gold draped over Gun Runner’s muscled shoulders, and the colt leaned into him with a comfortable familiarity, his eyes keen, his demeanor one of contained electricity. Belying his own imposing physical frame, Asmussen gently embraced the horse’s neck and pressed his face into a soft shock of shimmering mane. While other horses, trainers and grooms shuffled around the paddock during the schooling session, Asmussen and Gun Runner quietly steeled themselves for what would be the race of their lives — a race that secured the gold Eclipse Award as America’s Horse of the Year. Eclipse award for Older Dirt Horse and Horse of the Year. Richly deserved. A win in the Pegasus lets him go out in style and garners a nice spot in the pages of outstanding racing history. He had an outstanding year and both of those awards should have been unanimous, in my humble opinion. Hoping he can go out in style, but most importantly hope he can go out safe and sound to begin his new life. Something tells me he's going to light the breeding world on fire. Steve Asmussen trainee GUN RUNNER eyes the world, including his longtime hotwalker Juan Gonzalez, yesterday morning at @GulfstreamPark . Other horses' eyes who've reflected Juan include Curlin and Rachel Alexandra's. Juan is a real sweet guy. He's been with the Asmussen barn for a long time. You did it sweet baby boy. You did it. I love you. Any guesses on what his stud fee will be?